I try so very hard to eat non-processed, healthy, nutrient dense food. But one daily food craving in particular is making this healthy living business difficult for me! The problem – I love plain tortilla chips. I love them with salsa, hummus, guacamole or just with a squeeze of fresh lime juice. Yummmm! It’s become quite the vice lately though. I always crave them right after work + tend to binge a bit on them when I get home. I suppose there are worse things to crave, but I also know tortilla chips can be quite high in calories + fat. I normally prefer to only eat homemade snacks if possible – homemade snacks that are more nutrient dense than a few handfuls of tortilla chips. Fresh fruit + veggies are always great for snacking, but sometime you just need something salty/savoury. So, in order to overcome this tortilla chip “addiction”, I’ve decided to start testing out some healthier, salty/savoury snacks to have after work. First up, these fantastic, yummy Chile Spiced Pumpkin Seeds. The seeds are toasted and tossed with some fantastic, earthy spices. A light sprinkling of salt finishes them off and makes them perfect for curbing a salty-snack craving. The chile powder I used has a mild heat that is quite addictive! 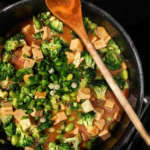 Since the spice mix is quite rich, however, there is no need to have more than a tablespoon or two. 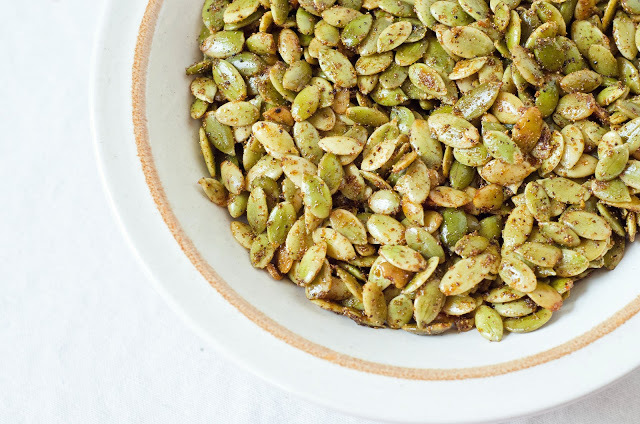 I think these Chile Spiced Pumpkin Seeds would be fantastic sprinkled on top a Latin-inspired salad. They would be a great addition to this lime cilantro black bean salad by my friend Destini at The Healthy Wife. Or on top of a tortilla soup or enchiladas. I think I’ll add them to my black bean burgers the next time I make them! They’ll add a fantastic spicy crunch to the burgers. Do you have any food you consistently crave? 1. Heat oil in a heavy-bottomed skillet over medium heat. Stir in the cumin, chile powder and garlic. Heat through for about 1 minute, stirring to combine. 2. Add pumpkin seeds and salt. Stir to coat the seeds with the spices. Stir seeds constantly until the seeds are a nice golden brown (about 7 minutes). 3. To retain their crunch, transfer seeds to a baking sheet lined with parchment paper until cooled. Once cooled, you can serve the pumpkin seeds or store them in a closed-jar at room temperature. Also, I would like to thank my friend Willow from Will Cook For Friends for the “One Lovely Blog Award” nomination! I was thrilled to receive the nomination from such a talented blogger! Willow is one awesome lady. I adore her writing style and am in awe of her fantastic food styling + photography skills. Please be sure to check out her wonderful blog! 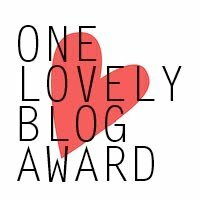 Upon receiving a nomination, one is supposed to do two things: (1) write up 5 things about oneself that other bloggers may not know or would find interesting and (2) nominate other inspiring bloggers for the “One Lovely Blog Award”. 1. I love to watch Criminal Minds. But then I can never sleep afterward! I’m a huge wuss sometimes. 2. I love, love, love afternoon naps. I don’t get to nap often, but when I do, it’s blissful and so relaxing. 3. Every single summer, I watch Big Brother. It’s my guilty pleasure. My winter guilty pleasure is The Vampire Diaries. My sister and I always watch it together. oh wow those looks so delicious! the perfect salty-crunchy snack! thanks for sharing! Awe, no problem! Thanks for stopping by + taking the time to comment :) Love all the wonderful comments! You are so nice…! thank you so much for the nomination. :) I am so glad I found your blog and all your amazing recipes!! I have a constant crave too…bananas and Peanut butter. I just love the combo…!! You are most welcome! I am glad to have found your blog too! Love all your creative recipes! the pumpkin seeds are looking yummy. thanks for the nomination courtney. i will be able to send the blog love once i come back from my vacation…. You are welcome Dassana :) I absolutely adore your blog. Your recipes are fantastic, your photos gorgeous and I love how you explain things so well. Hope you are having a nice vacation! hugs! these remind me of the chile spiced nuts at trader joes which i used to love and eat wayyyyyyyy too many of! what a great alternative. i think dayv might love these! love this idea! they sound delicious! These sound so good! I immediately thought of throwing them on a salad, but then I saw your burger idea- I think that’s the way to go! I think I’ll make some black bean burgers this week and add the seeds into the mix. I have a feeling it will make the veggie burger much more interesting! Great pop of flavour and crunch. I love your dog! Such a smart one! We hope to get a puppy soon. I definitely plan on teaching it what nap time is. *hehe* Naps are so comforting and cozy. Love them! I agree about cooked greens! I love spinach in every form and can handle it cooked in a dish, but if I get a piece of cooked spinach on its own it grosses me out. And in leftovers it’s even worse! Your pumpkin seeds sound great and I admire your efforts to make your own homemade snacks! These look so good Court! After work I always get hit with the urge to snack, on anything -sometime I crave carbs, nuts, crackers and hummus. I have been trying to up my water intake and that seems to help, and also just heading home changing for the gym, feeding the pup and grabbing a handful of nuts before heading to the gym so I am not loitering in the Kitchen!! I love pumpkin seeds! I try to eat a lot of them because they’re high in magnesium, which can help prevent migraines. But sometimes I get bored of eating them plain, so I’m going to save this recipe!